There are many injuries associated with volleyball, the most common affecting the joints of the knees, elbows and shoulders. Volleyball injuries can occur as the long term result of overuse/under-resting, or acute/traumatic injuries sustained during a game or practice. A 2007 study by the National Athletic Trainers' Association (NATA) found that at the high school level, the highest percentage of injuries affect players' ankles and feet (35.6%); hips, thighs or legs (16.2%); and forearms, wrists or hands (15.8%). In addition, experts say the most common injuries normally are sprains, which are instant injuries to muscles (48.6%); or strains, a traumatic injury to a ligament or joint that appears more gradually (25.5%). 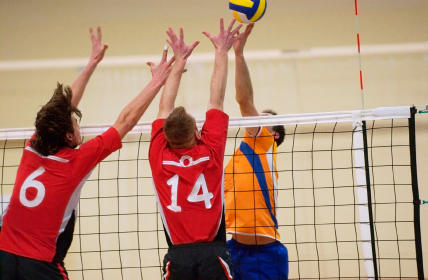 Muscular imbalances and overuse, or repetition of certain movements over time can produce tendonitis in the back, knee, achilles tendon, elbows, wrists and shoulders of volleyball players. Generally tendonitis is treated with ice, rest, compression , anti-inflammatory drugs, and rehabilitation/strengthening of the affected area. In more extreme cases, injections such as cortisone or surgery may be needed. Though less easy to describe or pinpoint accurately, lower back pain  develops in many volleyball players and is generally treated with medication (anti-inflamatory medications such as Ibuprofen), light stretching and strengthening or chiropractic visits. Lower back pain can be very difficult to diagnose and treat. Tears or strains of the rotator cuff in the shoulder are common among volleyball players., either acute injuries or as the result of overuse over the course of a season. Loose/unstable shoulders can develop over time as well. The best way to treat rotator cuff injuries is prevent them from happening in the first place by strengthening exercises. Rotator cuff injuries have a tendency to be chronic, as the shoulder never seems to sit well and is always affected by gravity. If a rotator cuff injury has been sustained, overhead motions should be limited, ice and anti-inflammatory medication such as Ibuprofin should be taken. Consultation with a sports medicine specialist is recommended. Rehabilitation and strengthening, after the pain has subsided, will help prevent future aggravation. Ankle: Ankle sprains , strains  and breaks are the most common types of acute injuries sustained in volleyball. RICE  and anti-inflammatory medications are generally used to to reduce initial pain and swelling, followed by rehabilitation and strengthening exercises, depending on the severity of the injury. Knee: ACL Injuries to the Anterior Cruciate Ligament (ACL) are common in volleyball (especially among females ). The ACL is damaged or torn when the knee rotates over a foot that has been planted and does not move. ACL injuries, depending on severity, are treated with RICE , or arthroscopic surgery . Fingers and Toes: sprained or “jammed” fingers and toes are common in volleyball and are generally not serious. Treatment with RICE  is recommended.